/ Home / Press office / PR features / Safety and security after Brexit. Who needs whom? 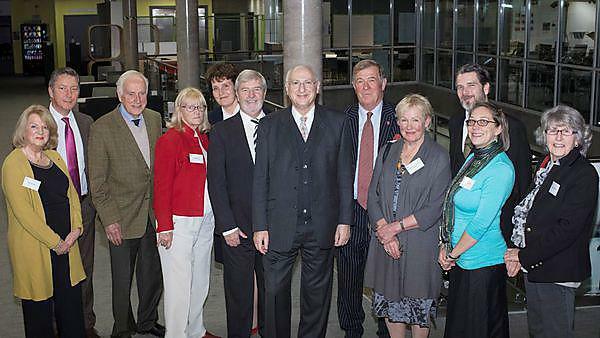 Group photo from the Lord Caradon lecture 2017 featuring (from left to right): Barbara Hill, David Alder (Trustee), Anthony O’Connor (Trustee), Janet Breed, Caroline Major (Secretary to the Trust), Colin Breed (Trustee), Lord Carlile, Simon Hill (Chair of Trustees), Lady Anita Townsend (Trustee), Jesse Foot (Trustee), Tracee Foot, Alison O’Connor. Hosted by the University of Plymouth the 2017 Lord Caradon Lecture welcomed Lord Carlile of Berriew CBE, QC, who presented a discussion around safety and security after Brexit. Between 2001-11, Lord Carlile was the Independent Reviewer of Terrorism Legislation; the Independent Reviewer of the Government’s new PREVENT policy and remains the independent reviewer of National Security policy in Northern Ireland. Watch the full lecture on YouTube. Pictured from left to right are Colin Breed, Simon Hill (chair) Lord Carlile and VC Professor Judith Petts. The Lord Caradon Lectures Trust was established to commemorate the life and work of Hugh Mackintosh Foot, Lord Caradon (1907-90). Today, the trust exists to recognise Lord Caradon’s long and devoted service to the ideals of the United Nations and his work for the UK’s contribution to those concepts. It aims to extend understanding of international affairs and tolerance of other ideologies, races and religions, primarily through the series of annual lectures. The lectures are always on a theme of international significance related to Lord Caradon’s life and work. Further information can be found on the Trust's website. Alex Carlile was born in Wales in 1948. After education at Epsom College he graduated LLB AKC at King’s College London. Lord Carlile was called to the Bar by Gray’s Inn (where he is now a Bencher) in 1970 and became a QC. in 1984, at the age of 36. Until 2009 he was the Honorary Recorder of the City of Hereford. He sits as a Recorder of the Crown Court, as a Deputy High Court Judge, and as a Chairman of the Competition Appeal Tribunal. Between 2001-11, he was the Independent Reviewer of Terrorism Legislation; the Independent Reviewer of the Government’s new PREVENT policy and remains the independent reviewer of National Security policy in Northern Ireland. From 1983-97 he was the Liberal (then Liberal Democrat) MP for Montgomeryshire in Mid Wales. During that time he served as spokesperson on a range of issues, including Home Affairs and the Law. He was Leader of the Welsh Liberal Democrats from 1992-97. He is the Chairman of the Lloyd’s of London Enforcement Board and is a non-executive director of a listed major agricultural merchanting company, Wynnstay Group plc. He is chairman of the not for proﬁt company Design for Homes and is a founder director of SC Strategy Ltd, a strategy and public policy consultancy.